James Paul Andre the Younger was a London based artist, active between the years 1823 and 1867. He painted landscapes of many English counties in oil. His work was exhibited at the Royal Academy, Suffolk Street Gallery and the British Institution. Among some of his listed works are views of Woodford Bridge, Loughton Church and Hainault Forest. Below is a selection of images from an album of works by Andre in the museum’s collection. This Windmill stood about 270 yards south-east from the south side of Lambourne Road opposite the junction with Vicarage Lane. The first mill here was erected in about 1610. The mill was struck by lightning in 1842 and burned down. The James-Paul André album of watercolours shows four views of the windmill, three of the mill and its immediate surrounding area, and a fourth from a distance, possibly painted from near the top of Manor Road at the junction of Hainault Road and Fencepiece Road. For over six hundred years Hainault Forest was part of Waltham Forest. All this changed in 1851 when an Act of Parliament was passed for the disafforestation of Hainault Forest, and this led to the destruction of 100,000 oak, hornbeam and other trees. The cleared land was sold for farms. A little woodland remained to the north of the King’s Wood, mostly in Chigwell and Lambourne parishes. However, by 1900 the bulk of the remaining woodland was in the private ownership of the Lockwood family of Bishops Hall, at Lambourne. Edward North Buxton, who had played a key part in the fight to save Epping Forest in the 1870s, could see the need to secure the last remnants of Hainault Forest as an open space for the public. In 1902 he persuaded the London County Council to purchase 801 acres of land formerly Hainault Forest in Lambourne and Chigwell and Foxburrows Farm. The ‘new’ Hainault Forest which exists today was formally dedicated as a public open space in July 1906. The Eagle Pond at Snaresbrook is an ancient pond that is shown on maps surveyed in 1773 (Chapman & André) and 1745 (Rocque). It was formed in the early eighteenth century by damming the valley of the ‘Snares Brook’ and was at that time called ‘Snares Pond’. It adjoins the Snaresbrook Road that runs west from the Eagle Hotel, once a coaching inn on the main Woodford Road from London to Newmarket until 1829. The watercolour painted by James Paul André in 1839, shows the pond from the west end. In the distance can be seen the Eagle Inn. Today the east end of the pond is shrouded with trees but the Inn can still be seen directly opposite the end of the Snaresbrook Road. The Royal Infant Orphanage was yet to be built at the time the picture was painted. The picture shows the head of a lane, descending into a valley, and in the distance a substantial mansion with a red-tiled roof. 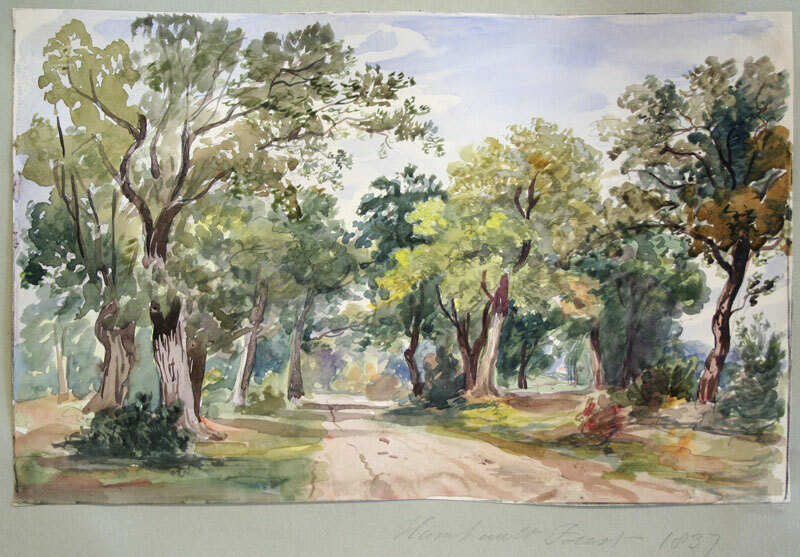 The most likely location from which André painted this picture is at Rolls Corner on the Chigwell to Abridge Road, looking down Chigwell Lane. The house in the picture may be the artist’s impression of Loughton Hall which had been burned down in 1836, and which was not replaced until 1876. ﻿Octavius Dixie Deacon was born at Bow in 1836. His father owned Samuel Deacon and Co., an advertising agency which Octavius described as the oldest in England, established in 1812. We know very little of his early life; however, with the media contacts of the family business they must have been kept up to date with the latest events and the latest celebrities. Octavius Dixie Deacon married Louisa Anna Horncastle in 1868. The young couple lived in Stoke Newington where their first child, Elgiva, was born, moving to Grove Street in South Hackney and then to Goldings Park Road (now Goldings Road), Loughton in 1874. Their house was the first on the south side of the road and had a 200 ft long garden. They lived there until 1888. By 1888, the Deacon family had moved to the top of Upper Park Road. Their new house, Kettering, had been largely designed by Octavius himself, although the project was managed by Edmond Egan, the Loughton based architect who designed the Lopping Hall. This house was demolished in the 1980’s. In 1998, Epping Forest District Museum acquired a collection of letters, books and sketchbooks connected with Octavius Dixie Deacon and some of his large family of nine children. The drawings and pictures in this collection show life in a small rural village in Victorian times. From examining Deacons’s sketches, one gets an image of a caring and loving family. Octavius often recorded his children’s lives in his drawings and also produced sketches for their entertainment. Octavius Deacon died on December 13, 1916. Thanks to funding from Arts Council England, over the past two years, Epping Forest District Museum has been working on an exciting series of touring exhibitions which encompass a wide variety of topics and interests. The series incorporates six exhibitions, including two that are co-curated by our Young Curators from Epping Forest College and Hertford Regional College We are now working on our fifth, sixth and final exhibitions that will finish the series off in time for May 2015. As we are now nearly two thirds of the way through the project we feel its time to take stock of our exhibitions and see what they have achieved. All of the following exhibitions are free to hire for venues in the East of England. Check our website for more photos of the exhibitions, to download the exhibition packs or to find out where the exhibition is going next. 1950s Fashion was the first touring exhibition of the series and explores both the everyday and extraordinary fashions of the 1950s. It contains vintage outfits of the time including a tailor made Teddy Boy suit designed and created by the tailor to the T.E.D.S. (The Edwardian Society). Visitors can listen to the experiences of those who lived through the mods and rockers, dance to the tunes on our customised jukebox and have fun dressing up in the outfits of the time. A fantastic exhibition that we all enjoyed putting together and launching, 1950s Fashion has proved popular with all audiences and venues and has already toured to six different locations since its launch. Next at: Mansfield Museum, Nottinghamshire. “We visited today as the children are keen on emergency vehicles. They really enjoyed the games, dressing up and the audio guide…if the children are busy playing, parents can read the information! Thank you, we have been to the Henry Blogg Museum many times so its really good to have a new part to explore” Visitor, Age 36-45. From Victorian volunteer fire brigades to today’s dedicated coastguard crews, this exhibition tells the story of the creation and development of the emergency services. It explores the lives of those working on the front line and the history of the life-saving services that we depend upon daily. This exhibition is a little different to the others as it has a special emphasis on emergency services in the East of England and includes an audio tour of collected objects and stories from across the region (which venues are able to customise and add to). There is a lot to see and the display is packed full of entertaining games and interactives. Taking you on a journey from the mischievous Mary Quant Fashions to the ground-breaking Nintendo Gameboy, this exhibition explores some of the most recognisable designs of the 1960s, 70s and 80s. Both innovative and unique, these retro design icons captured the imagination of their contemporaries and continue to inspire designers today. This exhibition features lots of hands on bits and pieces but my favourite part is the collection of original Nintendo Gameboys that visitors can play on. Design Icons is the first of the two exhibitions curated by our Young Curators. The exhibition was worked on from start to finish by two students from Herts Regional College and is designed with teenagers and young people in mind. As part of its launch, we also rolled out a series of workshops for young people interested in the creative arts. These can tour with the exhibition so look out for them near you. Now at: Lowewood Museum, Hertfordshire. We decided to put together a Cold War exhibition as November 2014 marked the 25th anniversary of the fall of the Berlin Wall, an event we thought should be commemorated and remembered. A thought-provoking and interesting exhibition, The Cold War taught me a lot about the tense struggle between communism and democracy and its effect on the world around it. Hopefully our visitors will learn a lot from it too! We really tried to show how the Cold War affected popular culture and so this exhibition includes the music and literature inspired by the conflict and even features a reading corner for those intrigued by the shady spy stories of the time. Next at: The Norris Museum, Cambridgeshire. Curated by students from Epping Forest College as part of our Young Curators Programme, this exhibition showcases the students’ artworks and interpretations of legendary mythical creatures. From mermaids to griffins, this exhibition has shown me a lot about the stories and beliefs that have been used to explain these mythical beasts. Next at: Epping Forest College. This exhibition will be a dynamic display featuring and celebrating the many ways that populations have kept themselves moving throughout time. The display will launch in July at Lowewood Museum in Hertfordshire, where it will commemorate the 175th anniversary of the opening of the Stratford to Broxbourne railway line. Next At: Lowewood Museum, Hertfordshire. 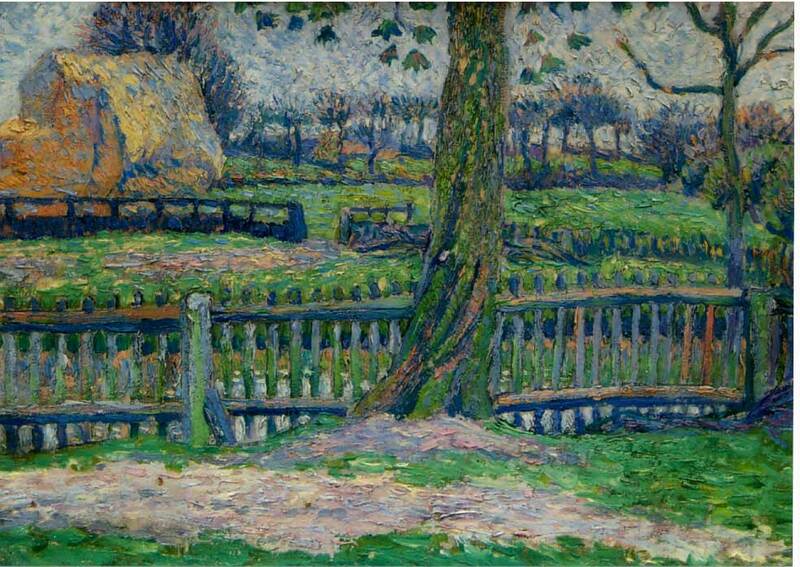 Lucien Pissarro was born in Paris in 1863, the son of Camille Pissarro and Julie Velay. 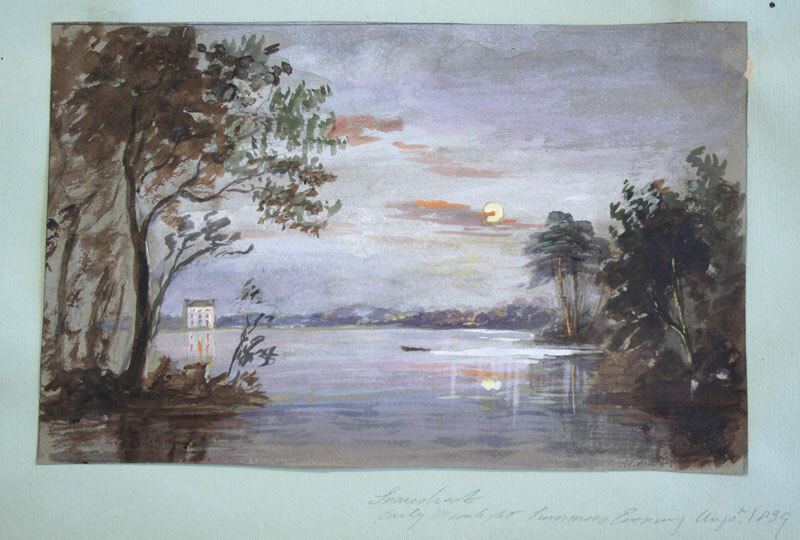 Lucien was a skilled painter, engraver and lithographer. He was taught by his father, Camille, who was a celebrated Impressionist. As an artist Lucien’s work combined elements of both the French and English traditions and he was a founder member of the Camden group of artists. His paintings record the landscape of Dorset, Westmoreland, Essex, Surrey and Sussex. Lucien’s works are reflected in a number of public collections including the Tate and the Ashmolean. Lucien visited England in 1870 as a child, worked there briefly in 1883–4, and settled permanently in the country in 1890 (although he often made trips to France), becoming a British citizen in 1916. Between 1893 and 1897 Lucien and his family lived at 44 Hemnall Street, Epping which he named ‘Ergany House’. This house still stands today and is marked with a blue plaque commemorating Lucien’s occupancy. During his first stay in Epping between 1893 – 1895 Lucien produced some 23 oil paintings of Epping as well as a number of watercolours. These capture a variety of scenes in the vicinity of Hemnall Street and also studies of local landmarks such as Coopersale Hall. He continued to paint right up until his death in 1944.